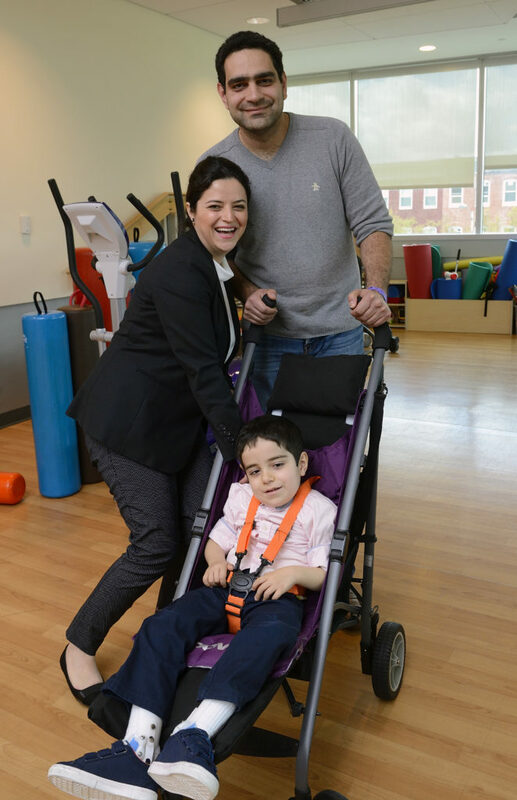 Karam Tarazi, a 6-year-old special needs child who was brought from Syria to Baltimore for treatment, is fastened into his newly customized stroller by his parents, at left, and by Sina Fahimi Hanzaei, right, the Johns Hopkins project’s student team leader. Photo by Will Kirk/Johns Hopkins University. The budding engineers recently presented the new stroller to Karam Tarazi, 6, to the delight of his mother, Dana Ajilikin. She said the students’ ingenuity will allow her family to enjoy more outings like the one she and her son recently enjoyed, touring through the tulips at Baltimore’s Sherwood Gardens. Family excursions were far more difficult before Karam’s revamped vehicle was unveiled. Now, to embark on such outings, Ajilikin just has to lift her son into the new lighter stroller and off they go. 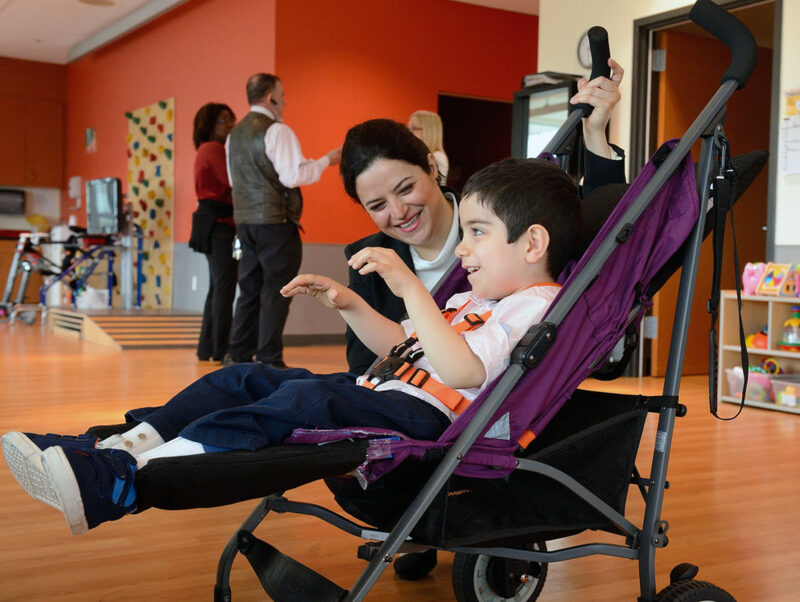 Karam’s parents, Dana Ajilikin and Ousama Tarazi, say that on future family excursions, the sturdy redesigned stroller will be much easier to manage than their son’s heavy wheelchair. Photo by Will Kirk/Johns Hopkins University. Born in Syria, Karam suffers from a rare progressive genetic disease that has damaged his nervous system, resulting in a lack of muscle control, spasticity, and other physical symptoms. The dark haired, big-eyed little boy cannot walk or talk. More than a year ago, his parents brought him to Baltimore from Damascus for treatment, and the family settled in the area. At a health expo last fall, Ajilikin and her husband, Ousama Tarazi, met Angela Tyler of V-LINC, a Baltimore nonprofit that matches people who have special challenges caused by disease or disability with volunteers who can design and build custom solutions for them. “Dana told me right away about the difficulty of managing Karam in his heavy wheelchair when she had to take him out alone, and how what they needed was a lightweight stroller that was big enough and sturdy enough for their boy,” said Tyler, V-LINC volunteer services manager. Tyler reached out to Niel Leon, a Johns Hopkins senior staff engineer and V-LINC volunteer who set up the project for the student chapter of the American Society of Mechanical Engineers (ASME) at the university’s Whiting School of Engineering. “A commercially available stroller that would meet Karam’s needs would cost more than $1,600. I knew the students were up to the challenge of creating what the family needed for much less,” Leon said. Working through V-LINC’s “What-I-Wish” program, the students had access to $500 for the parts and supplies they needed to create the custom stroller. Those costs are paid for by donors to V-LINC. Led by Sina Fahimi Hanzaei, a junior mechanical engineering major in the Whiting School, the eight-member student team set to work immediately, meeting with and observing Karam and interviewing both his parents and Brittany Hornby, the boy’s physical therapist at the Kennedy Krieger Institute. “Our goal was to design a stroller that would support Karam’s body and frame and hold him in a secure and comfortable position, while also being lightweight enough and foldable, so his mother could manage it on her own,” explained Fahimi Hanzaei. 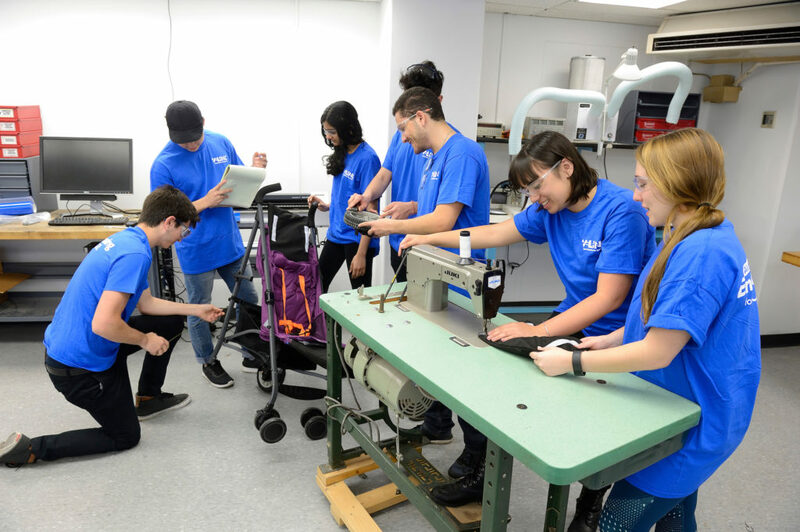 After extensive research, the students purchased an off-the-shelf, heavy-duty umbrella stroller designed to carry children up to 55 pounds, and modified it in several ways. First, they extended the head, back, and leg rests to accommodate the child’s long, slender build, and to allow for at least two more years of growth. Second, they replaced the original small back wheels with larger lawn mower wheels from a nearby home-improvement store. The resulting stroller weighs less than 15 pounds, supports the child’s unstable torso, and, best of all, folds up easily. Fahimi Hanzaei and Leon presented it to Karam’s family on the child’s sixth birthday. Photos available; contact Phil Sneiderman.